David and I are anchored in Lunenburg, Nova Scotia when another sailboat pulls up ahead of us to anchor. The man is up front, getting ready to drop the anchor while his female partner is at the helm. They start their maneuvers and begin dropping the anchor. Suddenly the woman is yelling and gesturing, trying to capture her partner’s attention. With his head in the anchor locker, he’s unable to hear her over the sound of the windlass working. To grab his attention, the woman leaves the helm unattended, stomps forward in the deck and slams her palm onto her partner’s shoulder. With his attention received, she’s loudly exclaiming and gesticulating wildly. The whole thing would have been comical except the unattended vessel drifting closer and closer to us. We later found out that their engine was unable to shift while they were anchoring. That’s pretty serious, but it could have been worse. 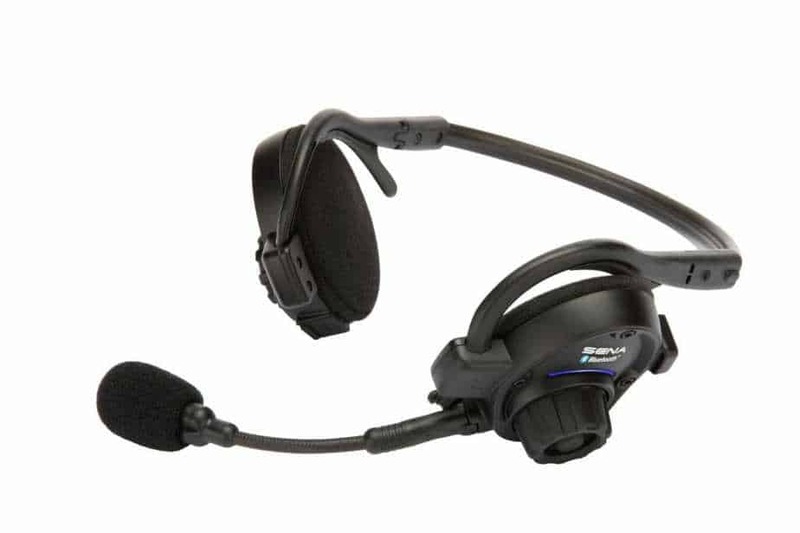 Headsets are a popular gadget aboard cruising boats, and cruisers sometimes call them Marriage Savers! 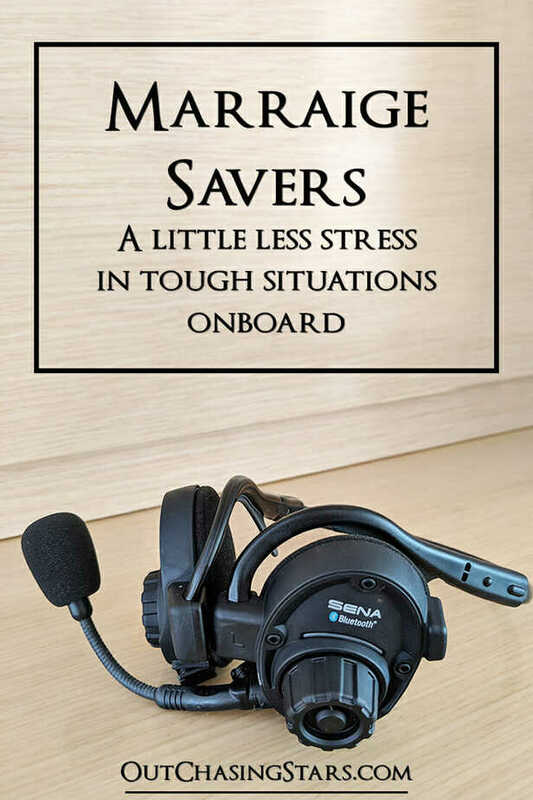 Marriage Savers used to be a brand of headsets made specifically for cruisers, but the company either no longer exists or no longer sells them. We used to have a pair of headsets we ordered from Amazon with a clip-on unit that attached to the headset via a cord. There was always a lot of static noise. The worst noise happened when David had to stick his head in the anchor locker. We attached the main unit to our waists, which was part of the problem. The helm pod, with all the electronics, was between my unit and David’s unit. There was often a lot of noise and static. Eventually, we stopped using them in lieu of hand signals. While sailing on Julia, Tom and Susan had new fancy Bluetooth headsets. They worked very well, so we ordered our own pair before we left Hawaii. Sena Bluetooth Headsets from Amazon. Our new headsets work incredibly well. 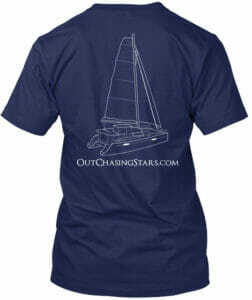 We use them while docking, anchoring, or going up the mast. We can talk to each other from anywhere on the boat – while I’m at the helm, David can be in the engine room, forward cabin, or anchor locker. The marriage savers nickname makes a lot of sense. 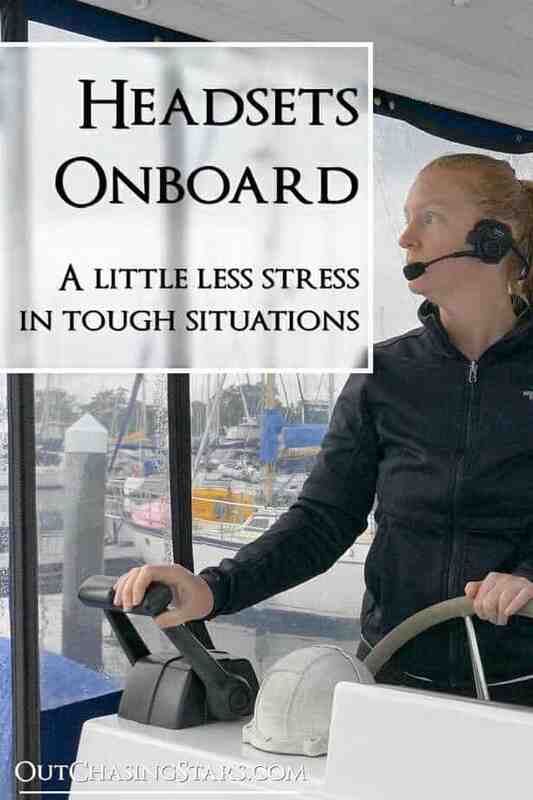 When docking, anchoring, or any other stressful situation, your partner can misinterpret yelling with being upset. We avoid all that hassle by being able to speak in a normal voice with each other anytime. Amy, my wife and I have been researching headsets and like the Senas, but many Amazon reviews indicate this model is a bit fragile. Numerous reviews state the plastic near the earpieces are weak spots that are easily broken. How have your headsets held up and do you still recommend them? 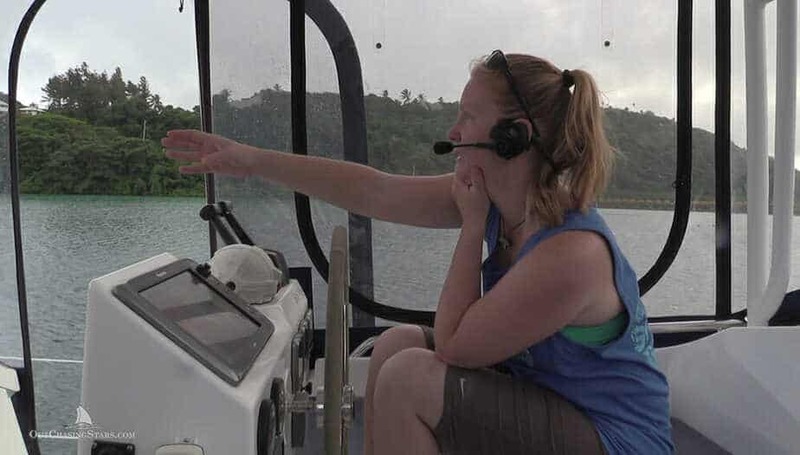 We have a Lagoon 42 and currently use headsets that are connected to a radio worn on the waist. They work well but are somewhat cumbersome which has prompted us to look into wireless headsets. Thanks! Hi Jim! Our headsets have still held up great. We have not had issues with the plastic near the earpieces, and our set is a year and a half old now. Hi Amy, Shelley and I got married a couple of weeks ago and exchanged these headsets instead of rings! We just use walkie talkies. I am impressed by the headsets but after looking at Amazon I think the price is exhorbitent. Looking forward to your next video – ie sailing on “Julia”. Yes they are pretty expensive. I’d love to see an iPhone app that could do this through Bluetooth. Catchy title!! I am trying to figure out how we, as landlubbers, can get equal benefit.